Up For a Game of Hanafuda? Daisuke setting up the cards to play a leisurely evening game with Mr Z. Mr Z is about to lose a lot of money… This is something he is quite familiar with. An order from Tata that I placed, um… well over a month ago (the week after Ota to be exact) finally came in. 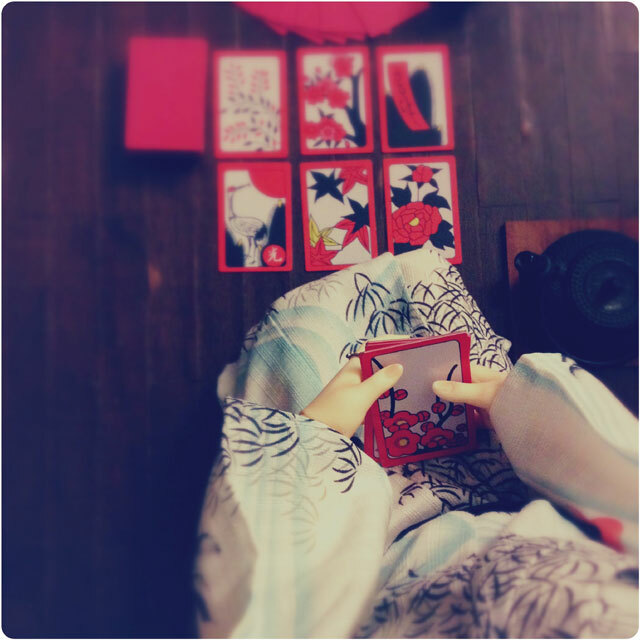 Daisuke and Mr Z (…who isn’t even here yet) have new yukata and a set of hanafuda cards. That auction I mentioned a post ago ends tomorrow while I’m at the farmers market (thank goodness for smart phones). So far so good, though I don’t think that will last.